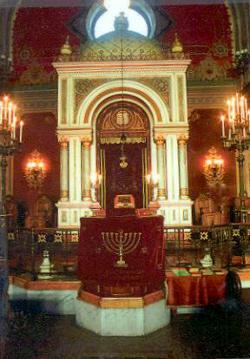 ...I arrive in Kossuth ter, the large synagogue of Pecs at the end of the street. A dear old gentleman is showing visitors around, greeting them at the door and asking where they are from. Deftly he then switches to their own language, whether it is French or Spanish, German or English, addressing them as Sir or Madam, and handing them a sheaf of type-written notes about the building and history of the schul. This Neologue [Reform] synagogue is similar in size and era to the Dohány utca one, but isn’t perfectly and recently restored. Not as pristine, a little worn and weary, but a very charming atmosphere. It has a fine blue arched ceiling above the Aron ha Kodesh, and the design features many eight-pointed stars which are traditionally a symbol of good fortune. In Judaism they represent regeneration. 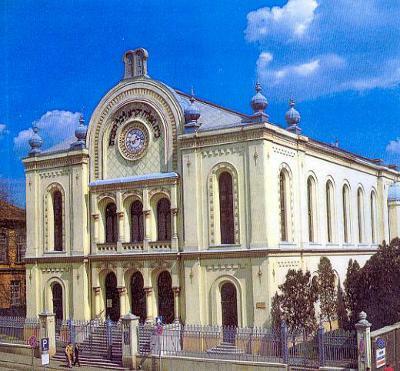 Like the Budapest shul, it also features oriental influences which is not surprising in this southern Hungarian town which was under Ottoman rule for many years. Construction began in 1865, took four years, and it was consecrated on 22nd July 1869. It is representative of the Hungarian Romantic 19th century style. The builder was Stephen Istvan Ivankovics from plans made up by three well-known architects: Feszl, Gerster and Kauser. It was the third schul to be built in Pecs, but is now the last remaining. The interior is in original condition, the only addition being electric lighting. 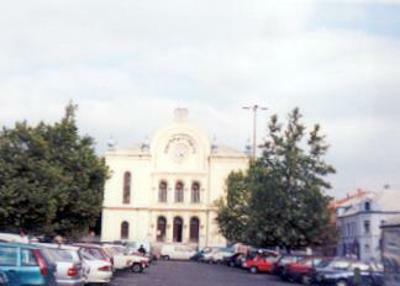 Between 1980 and 1983 the exterior was renovated. There are two aisles and a nave, and a two-storey gallery with seats for 448 women. The ground floor seating can accommodate 476 people. The galleries are no longer used, the men now being seated on the right, the women on the left. There are pews carved of Slavonian oak, rosette windows and rich ceiling paintings. The names of past office bearers and rabbis are recorded in the vestibule, and among the past cantors is the father of world famous opera star Dezso Ernster, who died at Auschwitz. Also, there is a memorial to community leaders killed in the Holocaust. Prior to 9th May 1944, when all Jewish citizens of Pecs were forced into the ghetto, the schul’s membership was some 4000. A mere 464 souls survived the war, a loss to the local Jewish community of 88%. The inhabitants of the ghetto were transported to labour and death camps. The current Jewish population of Pecs is about 300, mostly elderly people. I wish the guide Le Shana Tova, and return to the station, preparing for an unsettling journey into eastern Croatia later that evening, and ending my day in a bomb-damaged hotel in Osijek.